It was at delightfully named Peachland in British Columbia, that I knew I was hooked. 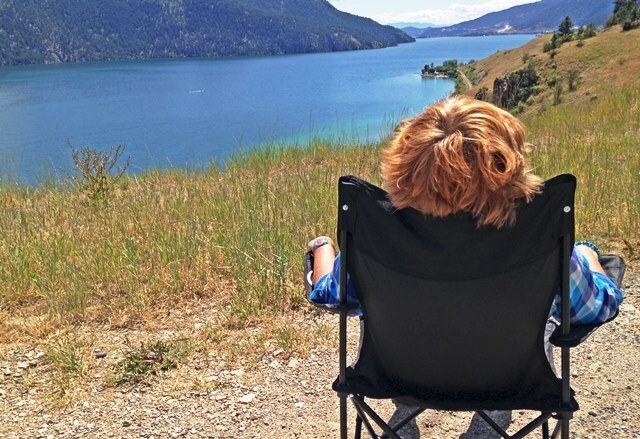 Sitting on a folding chair, ham salad on lap, gazing out across tranquil Okanagan Lake, surrounded by mountains, the early summer sun shining, all was right with the world. 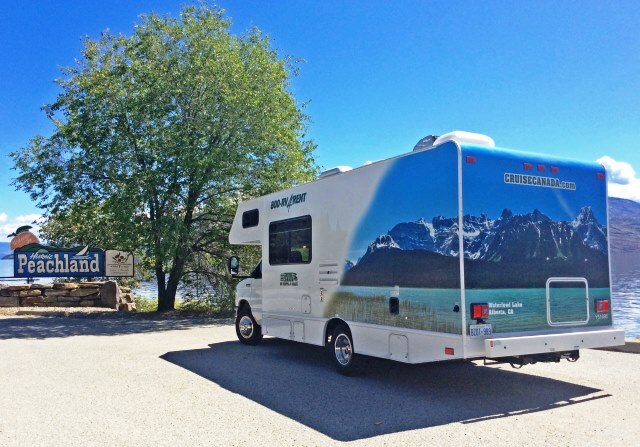 Our motorhome waited patiently in the lay-by, ready at any moment to take us further on our journey across Canada. But for now, we sat and enjoyed the view and appreciated the simple pleasure of lunch al fresco on the journey of a lifetime. Prior to the Canada Road Trip, I had never driven anything bigger than the school mini-bus and very little experience of motorhome travel. My grandfather had an old Bedford campervan but never took us on trips in it. I’d been on a couple of caravan holidays when I was a teenager; in those days caravans were fairly basic and I remember the rain dripping in through the roof on a stormy night in Wales. More recently I’d travelled to Cornwall in a friend’s campervan on a family holiday but we’d not stayed in it. Though a VW campervan is synonymous with cool surf-dudes, I had a bias against caravans and motorhomes, thinking they were a bit fuddy-duddy, for ‘oldies’ and definitely not ‘my thing’. Rocky the RV changed all that. Photographer Ali Bailey and I travelled over 3,000 miles from Vancouver to Calgary via the Rockies, in a Cruise Canada RV (Recreational Vehicle) and felt so attached to our motorhome that we gave him (oh yes,) a name. What I loved was taking everything with us, not having to unpack and pack every night, being able to stop in the middle of nowhere and rustle up a meal (or use the loo) and the cosiness of having our own ‘home on the road’. I was nervous about driving such a big vehicle but surprisingly quickly got used to it and by the end of the trip was actually enjoying it. 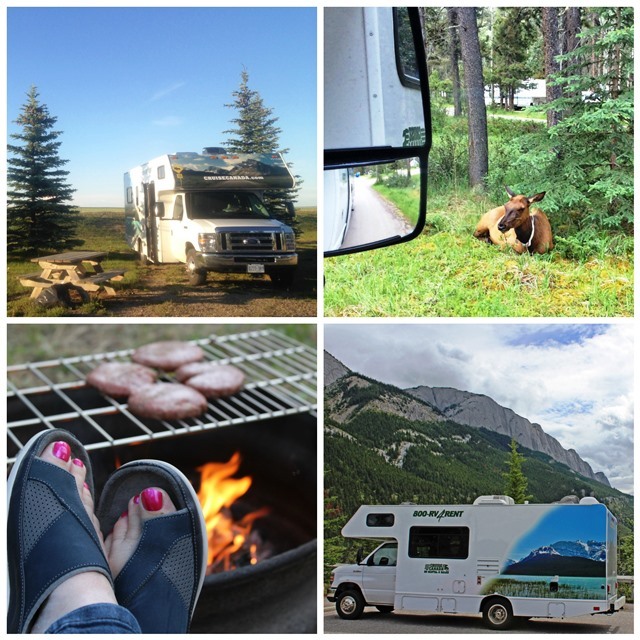 We stayed at some lovely campgrounds; Canada is well set up for motorhome sites, which are usually ‘fully-serviced’ ie with electricity, water and sewage connections. They’re also very convivial places. Highlights included waking up on our first morning to a glorious sunrise over Osoyoos Lake – our pitch was on the water’s edge. You can see just what it looks like in this video. Chatting to the ‘good ol boys’ from mid-west America about the upcoming elections beside Osoyoos Lake, eating kebabs and burgers cooked on our BBQ in Jasper, waking up to hear elk wandering around outside the motorhome and drinking beer as sun set over the Rockies in Banff. Since returning to the UK I’ve been extremely envious of anyone who owns a motorhome … Two of my best friends bought one a couple of years ago and rave about the freedom of the road and the fun they have getting away as often as possible. They’re fanatical cyclists and simply strap the bikes to the back of the ‘van’ and off they go. 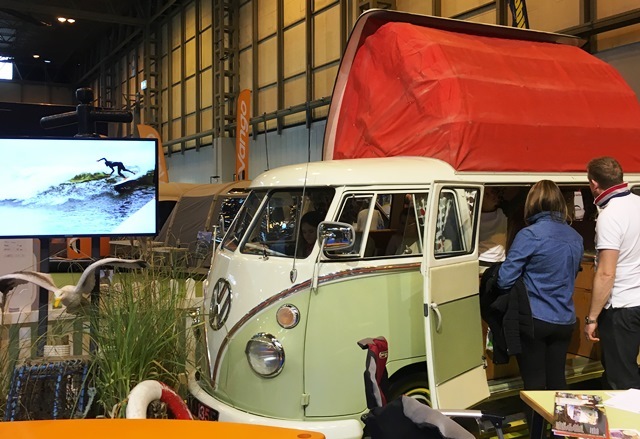 So when I got an invite to this year’s Caravan, Camping and Motorhome Show at the NEC Birmingham I leapt at the opportunity. 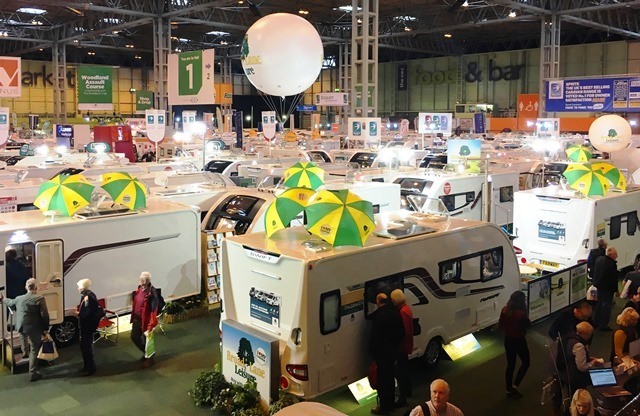 Five halls crammed full of every kind of caravan, motorhome, campervan, tent, holiday home and accessories you could ever wish for. 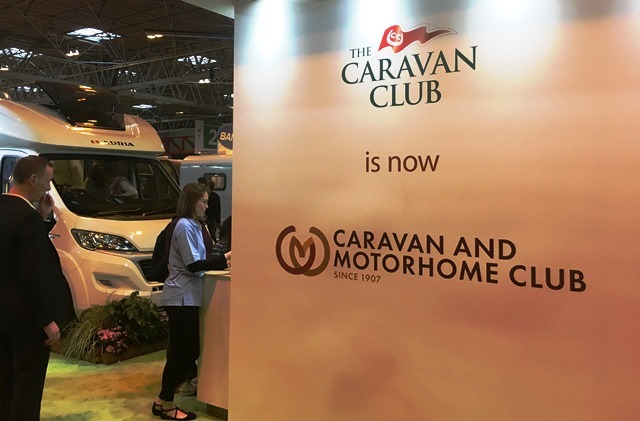 On the first day of the show, the ‘Caravan Club’, founded in 1907, announced its brand new name, ‘The Caravan and Motorhome Club‘, in line with the increased interest and motorhome ownership in the UK and around the world. Chairman Grenville Chamberlain explained, “We’re responding to today’s market and becoming more inclusive whilst retaining our core values and heritage.” Marketing Director Harvey Alexander was clearly very excited about the changes. “Our new logo and name reflect the evolving nature of the club. 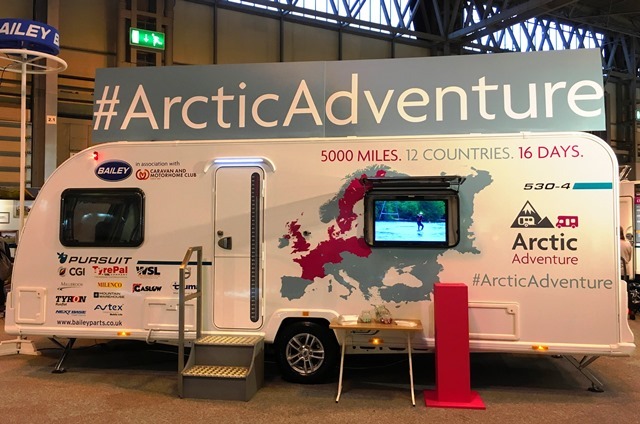 It may take some members time to get used to the change but so the overall response has been incredibly positive.” Everyone I spoke to thought it was an excellent idea and would will encourage more people to join ‘the biggest touring community in Europe’. I think it’s a very positive move. 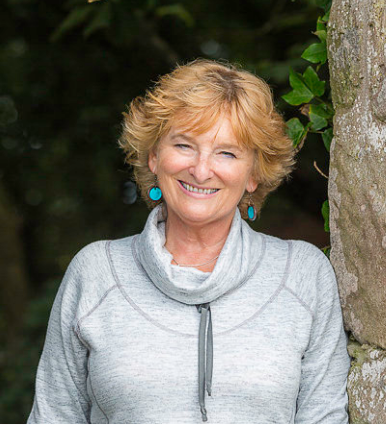 As a recent convert to motorhome holidays, I can vouch for the pleasure to be had taking a luxurious ‘home from home’ on the road and choosing different places to stay along the way. Find out more about The Caravan and Motorhome Club here. Thank Charles – always nice to know that people enjoy the writing and hope you have a year of very quirky travel! Yes, John, I should think Scotland would be a great place to explore with a campervan or motorhome. Friends Jenny and John often got up to Scotland in their motorhome. I think the main difference between the two is the CV is usually smaller with basic facilities and no division between driving and living area. 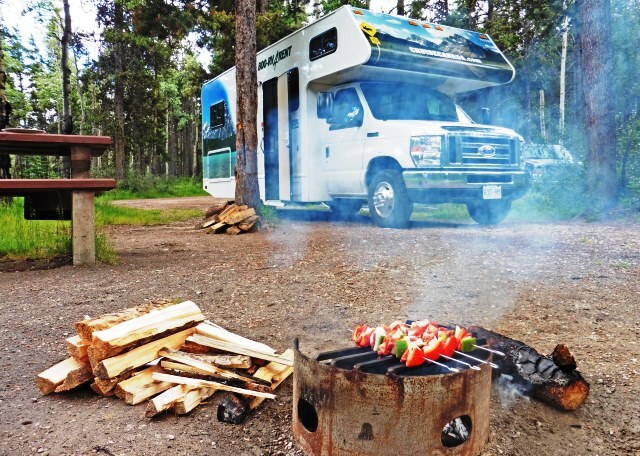 Motorhomes (RVs in North America) are usually bigger, very well-equipped and can be easily lived in as temporary home.